If you only attend ONE community meeting this year, THIS should be it. The Strawberry Design Review Board (responsible for reviewing development proposals) will be reviewing the initial proposal from the North Coast Land Holdings group to build 300 units and a (up to) 1000 student Branson Campus at the current Seminary property. This proposal has the potential to dramatically change the nature of the community we live in. Whether you oppose it or favor it, this is the meeting to make your thoughts known. The county Planning Department, Planning Commission and Board of Supervisors rely on the Strawberry Design Review Board to make recommendations about the Strawberry community, and the SDRB relies on YOU, members of the community, to make your voices heard. The actual proposal (which is hundreds of pages) can be found on the County website by clicking here. A former Design Review member wrote this Marin Voice article for the Independent Journal about the need for the community to get involved, and here a former Branson board member laments Branson’s lack of engagement with the community in another Marin Voice article. Seminary Neighborhood Association, a local community group, has created a FAQ about the proposal which you can see by clicking here SNA FAQ November 15 2015. In addition, you can find letters written to the SDRB by the Seminary Neighborhood Association’s attorney and a local resident about the proposal, discussing some concerns, here Ltr – Marin CDA – completeness – 11.20.15 and here McDevitt SDRB Letter 11-30-15. If you have an opinion, come, bring a neighbor who may not be aware of this meeting, and express it. If you don’t have an opinion yet, come and learn about proposals that may have a huge effect on the place you live. Either way, it’s important that our residents come out and participate in the most important decisions about our neighborhood for the next hundred years. You’re invited to join Strawberry residents at a meeting hosted by the Strawberry Community Association to review current activities that may affect traffic congestion in Strawberry and Southern Marin. – the Belvedere Place office behind In ’n’ Out Burger is being considered for a Marin General Hospital Clinic of almost 50,000 square feet, on top of the current growth in medical services in Strawberry? – Mill Valley has a “traffic task force” that recently floated a busing pilot program idea focused on Strawberry Point Elementary, since more than half of Strawberry Point students come from the other side of 101? – metering lights on 101 are being planned for next summer, along with modifications to the 101/Seminary Interchange? – CalTrans has been considering an additional traffic light at Knoll Drive and Tiburon Blvd? All this is in addition to the stated plans for the Seminary property, which includes a high school larger than Marin Catholic and an additional 10% growth of Strawberry housing. Strawberry Community Association is dedicated to making sure that Strawberry residents are informed and represented in the decisions that affect their community. Traffic is one of the most important concerns in the county today, and one that county government is always considering changing. None of these events may happen – or all of them may, and we could find Strawberry as the Southern Marin version of “S. Eliseo Drive” of medical facilities, along with the largest private high school in Marin, expanded intersections and traffic lights, and an E Strawberry Dr. pullout for school buses. You may approve or disapprove – but you should be informed and make your voice heard! Join us, and learn and discuss the latest about these and other current events affecting Strawberry. All are welcome regardless of point of view. Strawberry Community Association is a 501(c)(4) non-profit organization. Seminary Development/Branson School – There have been no new public developments from either Fasken Trust or Branson, though Branson continues to privately express confidence in their relocation to the Seminary campus. We are equally confident that the current community plans do NOT provide for a private high school, and it will be important to make sure that our county representatives recognize this as well. If you want to get more engaged in understanding the issues with the Seminary development, contact the Seminary Neighborhood Association, who have been spearheading the effort to prevent overdevelopment of the Seminary property over the last five years, at www.SeminaryNeighbors.com, or contact us by selecting “Contact” on the menu bar and filling out the form, or emailing us at StrawberryCommunityAssociation@gmail.com. We need your help! An important Planning Commission hearing is scheduled for Monday, November 17th, at 1:00PM, at the Civic Center Room 324, and we need you to join us in speaking for the Strawberry neighborhood. The hearing will focus on the 2015 – 2023 Marin County Housing Element, the “element” of the Countywide Plan responsible for future residential, commercial, and agricultural development. The State of California requires all cities, towns, and counties to file a housing element every seven years to indicate where all types of housing, but especially taxpayer-subsidized housing, could be built for that period to satisfy a regional allotment. It’s not required that the housing identified be built, though it’s believed identification in the Housing Element makes it easier for housing plans to get approved. The issue is a specific zoning change, affecting only Strawberry, Marin City and St. Vincent’s/Silviera Ranch in San Rafael, which remains intact regardless of whether the projects identified in the period are constructed. Two years ago the County also submitted an Affordable Housing Combining District (AHCD, or AH for short) on two acres of land in the Seminary. An AHCD is simply a taxpayer-subsidized housing overlay on a parcel of land – in effect changing the zoning. The change to the Seminary via the AHCD was a density of 30 units per acre (increased from 2.47 per acre), plus the potential for an additional 35% density bonus for certain developers of taxpayer-subsidized housing, on each of the two acres, for a total of at least 60 units. The County’s imposition of this ACHD overlay on the Seminary’s property went through NO community review or approvals process. Nothing in the guiding documents of our community (the 1982 Strawberry Community Plan and the 1984 Golden Gate Baptist Theological Seminary Master Plan) permits 60 units of taxpayer subsidized housing on the Seminary’s property. Instead, the County circumvented the normal public review and comment process of amending an existing Master Plan to implement the ACHD. We believe that under no circumstances should the County do an end run around the amendment process for these plans. Additionally, Marc Levine’s recently passed AB 1537 re-characterized Marin County as a Suburban Area instead of a Metropolitan Area, reducing default zoning from 30 to 20 units per acre. 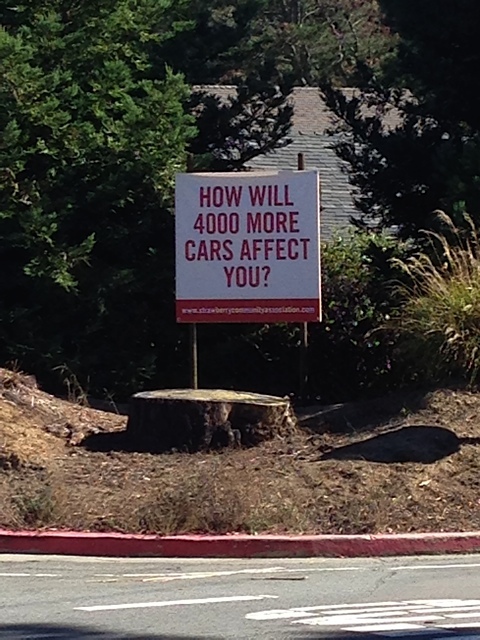 While the reduction is obvious and logical to Marin County residents, the Board of Supervisors must vote to implement AB 1537 and approve it for the AHCD to reflect this reduction. We have to ask for it – and, if we need to, demand the reduction, if not the outright elimination of the AHCD. Reduce the default density of any Marin AHCD from 30 units per acre to 20 units per acre to conform to Marc Levine’s recently approved AB 1537, which re-characterized Marin County as a Suburban Area instead of a Metropolitan Area. Rescind the Seminary ACHD entirely. It’s unfair and unnecessary. Moreover, Supervisor Sears tried to rescind it last year, but her fellow Supervisors voted against her 4 – 1. Given the large buffer of sites for “affordable housing” in the 2015 – 2023 cycle, the County can easily meet it’s housing allotment without the Seminary AHCD. The time to rescind is now. This is NOT a stance against affordable housing. Whenever the Seminary property does get developed, there is a legal requirement for at least 20% of housing to be affordable to low- and moderate-income households unless the developer pays in lieu fees to get out of it. We believe all developers should have to live by that 20% rule. We don’t need to be singled out for the AHCD as well. For additional information about the Seminary AHCD or Housing Element issues, please see Ray McDevitt’s Letter_to_Kate_Sears_re_AB_1357, attorney Riley Hurd’s letter on behalf of the Seminary Neighborhood Association to the County here, and Sustainable Tam Almonte’s letter to the County here. I support the letters submitted by Ray McDevitt and Riley Hurd about the Golden Gate Baptist Theological Seminary’s Affordable Housing Combining District. Click on the below links to see the 3 pages of the letter from Seminary Neighborhood Association’s position on the Housing Element. The first hearing for the new 2015-2022 Housing Element is happening THIS MONDAY with the County Planning Commission at the Civic Center. We need Strawberry residents to show up and represent Strawberry – if you’re comfortable speaking publicly, please take your 2 minutes in front of the Planning Commission and raise one or more of the key concerns below. If you’re not comfortable speaking publicly, your attendance alone will help send the message that we’re concerned and watching. 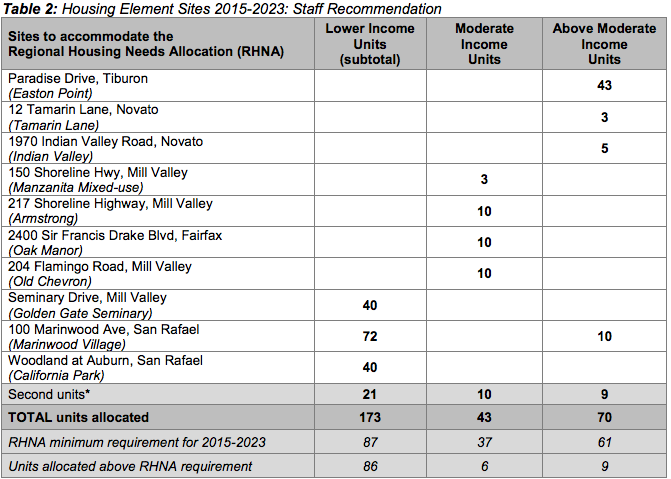 Despite the reduction in Regional Housing needs in unincorporated Marin from almost 800 units to under 185 units, the allocation at the Golden Gate Seminary site remains at 40 units, virtually unchanged from the last Housing Element assessment except to designate them all as Low Income. – the Strawberry Community Plan and Seminary Master Plan are not consistent with development of any additional housing other than for students and faculty; given the Seminary’s sale of the property, how can it be likely that they will develop additional student and faculty housing? * This proposal includes TWICE the number of required units; during the last Housing Element it was argued that more were needed in order to be sure there are enough in the event a location is eliminated from the list; we reject having units allocated and approved on that basis. The county has time to verify locations that work and allocate them correctly. In fact, if they are proposing these locations because they have already been approved, why not allocate 22 units at each of the 3 locations, or 10-15 units each at other previously approved locations? * The county has previously included 20 “Second Units” per year in their calculations; 8 years at 20 units would almost fulfill our requirements by itself, and would be in keeping with the general flavor of Marin. This cycle, the calculation includes only 5 Second Units per year. A September 7, 2012 letter from HCD approving the final draft of the previous Housing Element explicitly indicates that the allowance for 20 Second Units per year was appropriate. How has that been reduced by 75% in these last 2 years? * Are the 200 units of affordable housing for agriculture workers included in the previous Housing Element already completed? If not, why are they not included in the list? 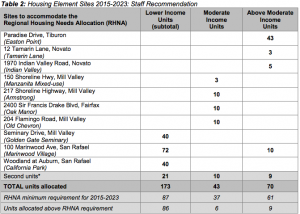 This is a key initiative of the Marin Workforce Housing Trust – how can this not be more likely to be built out than other locations in the county? * The County Development Code requires that residential subdivisions and most residential and mixed use development projects include a 20% set-aside for affordable units. Does the fact that none of the locations for moderate or above moderate development also include these affordable allocations mean that the county acknowledges that market rate developments will always buy their way out of building required affordable housing, that the entire program is not really intended to create affordable housing? * Goal 2 of the Housing element is to Meet Housing Needs Through a Variety of Housing Choices – Respond to the broad range of housing needs in Marin County by supporting a mix of housing types, densities, prices, and designs. How are these Lower Income Units at density in three locations a variety of housing densities and choices? * A more disingenuous representation of their public outreach process is hard to imagine. The feedback was generally that the assumptions were flawed, that the “choose from our pre-approved menu” process was not worthy of engagement (or of the County), and that with such a reduced target the County should be further exploring (not diminishing) individual unit and second unit opportunities to meet the allocation. * The “Housing Element” is the housing component of the Countywide Plan, which is intended to ensure to the state that the County has identified adequate locations with potential for growth at both market-rate and low-income levels. * While designation in the “Housing Element” itself does not change zoning or ensure properties are developed, it is both an encouragement from the County that an area has met certain criteria for development, and a doorway to potential streamlining of CEQA and other evaluation steps before development (See SB375). People who missed the April 27 meeting about Strawberry’s future development and the Seminary property proposal have been asking about the meeting and where they can find the survey handed out there. * there are county-approved plans in place that guide development of all of Strawberry (the Strawberry Community Plans of 1973 and 1982) and specifically what can be developed on the Seminary property (the Seminary Master Plan of 1984). * we want to be able to tell the prospective buyers (and the County) the specific areas of concern the Strawberry community has about the general scope of the plan before getting into details, as well as what Strawberry residents would like to see happen with the Seminary property in the event of a sale.